A “peachy” delicious all-in-one dinner that takes little preparation time! Drain the peaches, reserving the syrup. Set aside 8 peach slices for garnish; dice the remaining peaches. Add enough water to the syrup to measure 1 cup. Set the peaches and syrup aside. In a large skillet over medium heat, brown the chicken in oil. Stir in the butter, brown sugar, vinegar, allspice and reserved syrup. Bring to a boil. Reduce the heat; cover and simmer 5 minutes. 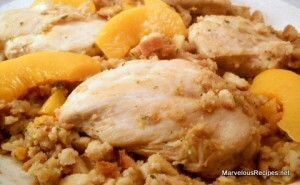 Stir in the dried stuffing mix and diced peaches. Remove from the heat. Cover and let stand 5 minutes; serve with peach slices. Makes 4 servings. I have made this before and it is yummy! What a unique recipe. Well, sorry about the weird Mr. Linky thing today. Your post is perfect for Tempt My Tummy Tuesday. Sorry you thought that I had deleted it. Every now and again Mr. Linky gets “sick”. (ha ha) Also, you did just the right thing by listing my blog and saying that you linked to it for Tempt My Tummy Tuesday. That is how the blog carnival works. Thanks for participating. By the way, I will probably add you to my sidebar links. That sounds really good! Thanks for stopping by my blog and checking out my cupcakes! Oh what a great combo. I love the sweet with the savory. Thanks for sharing!